I included this because I thought it would be great to experiment with a new and different realm of photography. Every time I have seen a photo taken with a Fisheye Lens, I've always thought to myself that the images look like so much fun to create. I really wanted to test my limits and see what I could do with one. Using a Fisheye Len was everything I was hoping it would be and so much more! It was such a great learning experience and really got me thinking outside of my comfort zone. Shooting with this lens was so different from shooting with the lenses that I am used to using, and I had to look at everything in a different way. It brought an excitement to shooting that I haven't felt since the first time I picked up my camera. Did I end up with any show stopping images? Nope. Did I have A TON of fun playing around with this lens for the past week? You bet I did! I'm going to spare you the lesson on Fisheye Lens, but I will say that if you ever consider renting or purchasing one, make sure you do your research and know exactly what you are getting! I was surprised by how much there was to learn while I was trying to decide which lens to rent. I settled on the Canon EF 8-15mm f/4L Fisheye. I don't shoot with a full frame camera body, so most of the other options weren't going to provide that typical fisheye distortion look. That's all well and good if you're wanting just a wide angle lens, but I wanted to have myself a little fun seeing just how much I could distort reality! And distort I did! It took me a while to get the hang of using the lens. Everything I read about shooting with a Fisheye said that you have to get close to your subject, and that everything would look farther away than in real life. They weren't kidding! One of the photos I tried taking was of a flag off in the distance framed by trees on both sides of it. It truly would have been a gorgeous shot with a zoom lens. I took it with the Fisheye, got home and put in on the computer, and I would have needed a magnifying glass to even see the flag! After the first couple of times using the lens, I finally started to figure out what it could and couldn't do, and that's when the fun began! My goal for my week was to spend as much time with the lens as possible, and see how many different things I could come up with to photograph, while applying the fun barrel effect that Fisheyes are known for. It's a series of photos I took of myself while hand holding the camera. It was kinda fun to see the different ways I could distort my face! This was my second time shooting with the camera, so I hadn't quite learned yet how close I needed to get for maximum distortion. If you've never seen photos taken with a Fisheye lens before, take a close look at each of the images and see how things are distorted. Check out how the headboard on the bed, and the whole room in general are curved. Check out how long my arms look, and how small and far away my body looks. Check out how HUGE my forehead and nose look in some of the photos, and how about those glasses?? I purposely wore them, instead of my contacts, because I thought it would add even more fun to the photos. I hope you'll come back later this week to see more photos from my Fisheye Lens Experiment! Pretty wild! I can't wait to see more of your pictures. 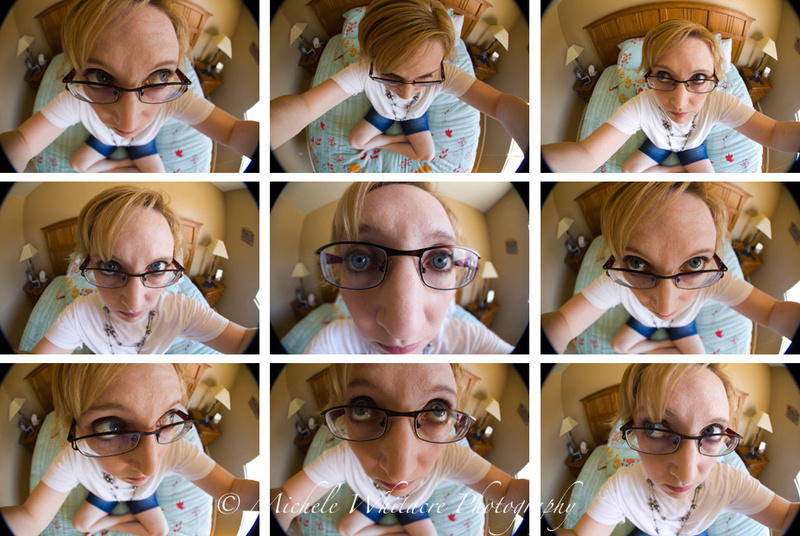 Yes, Fisheye Lenses do create some pretty wild and weird photos!